But, is it healthy to be either so unbelievably, hyperactively, excited? Or really rather down in the dumps, so much so that I just want to throw myself on my bed and cry? Some have suggested going to my GP, as it may be some form of bipolar disorder. I know it could be, as this is a genuine depressive illness that affects many people. I was given antidepressants when I first came off the booze, as I was pretty screwed up and in a state of shock. I chose not to take them though, and gradually came out of my ‘slump’ naturally. I didn’t take them, as I figured that at such a time in my life, it was pretty natural to be the way I was, and I felt my doctor (although lovely and helpful) diagnosed this ‘mental illness’ too easily from a brief chat in her office. No disrespect to my doc at all. I understand that her workload is massive and the illness very common. So I have really thought about how these particular conflicting emotions affect me as they happen. On the one hand, I can be very down, and when I am, I can throw myself into this depressive state and I find it quite easy to succumb to my grumpy mood. In fact, sometimes I rather enjoy a good cry and find that it can clear my head and get it out of my system. I could always push it away and try and act cheery until it overwhelms me, but I just like to get it over and done with, spurt out my snots and tears and get it out the way. It actually reminds me of my early to mid-teenage years. When I used to drag myself around school in my beloved Doc Marten boots, with my frizzy hair hanging in my face, listening to Nirvana, actually believing that Kurt Cobain was the only one who understood me! Writing, ”Woe is me” poetry all over my school bag and pretty much trying to act like a rebel without much of a cause. Ahh… how I loved those days. The shy, awkward teen, taking the very questionable, “I am in pain, but a very cool pain it is-ness”, all too far. It makes me smile to remember myself before addiction took hold. So I don’t panic and rush off to the doc’s when I am low. I just let it out and I don’t see the harm. I may be immature and overly sensitive. I am also only human. There is the other end of my emotional spectrum, which does tend to annoy people around me sometimes, and that is when I have my moments of incessant, ‘I feel like swinging on a star’, over-the-top, hyper-ecstatic-ness. That last sentence is no exaggeration. I find myself so overcome with glee now and then, that I am annoying people to the extent that they get up and leave the room. Anything can set me off. I can get so excited that I pretty much start letting off party poppers, whilst cart-wheeling round the living room with me t-shirt on me head, shouting, “La lalala laaa!” and whistling a tune! But hey amigo’s, I am alive. And I don’t just start acting like this in the middle of the supermarket when shopping for milk, cheese and bin bags. It is usually confined to my home. I just sometimes feel very happy and I can’t keep it in. Yesterday, I decided that I would teach my four-year old daughter and six-year old nephew the Peaches song by the Presidents of the United States of America (excellent tune). I found myself so enthused by this lesson, that when I next looked, I was standing on the coffee table using my T.V remote as a microphone. Men in white coats, you say? This ‘giddy’ self seems to have been hidden away since my teens. Perhaps my addiction stunted my emotional development and I just haven’t grown up properly. Perhaps I am just learning to be an adult now that I am putting my dark, disturbing, alcoholic past behind me. So, no. I don’t think I need medication to help me deal with my emotions. I actually quite like them. I have a future. I have my daughter back. I am no longer drunk. And I can actually feel my feelings. I had resigned myself to being trapped in a burning building, waiting for it’s collapse to take me down with it to the pits of hell, only to find an open window at the last moment and throw myself free. But boy, was it close! 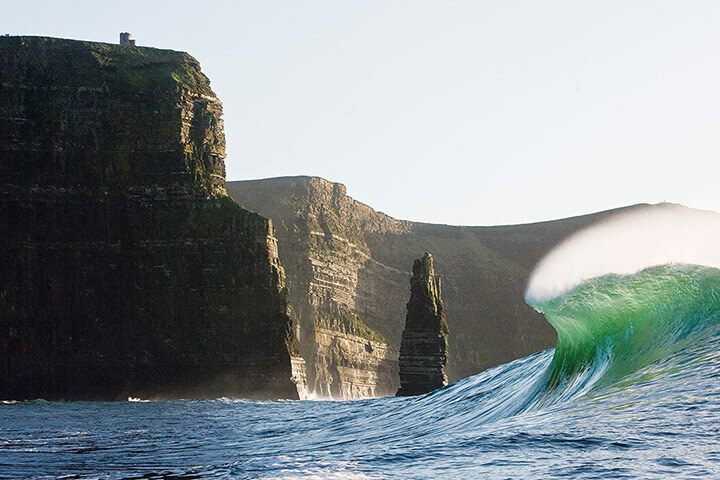 Another surf photograph from The Guardian, this time from Mickey Smith.